Rusell Title and his father, Supt. 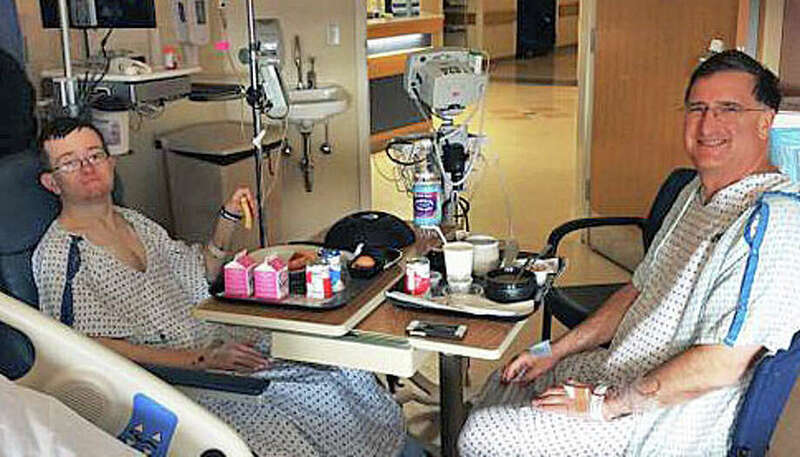 of Schools David Title, share a meal at Yale-New Haven hospital after David Title donated a kidney to his son. It was not a typical birthday present. It was, however, a very consequential one. Four days before his 26th birthday, Russell Title’s father, David, better known to most Fairfield residents as the superintendent of the town’s public schools, donated a kidney to his son. “He’s doing better than I am,” David Title said during a recent interview with the Fairfield Citizen, about four weeks after the father and son’s surgeries. “He’s got a lot of energy because he now has a functioning kidney.” The 58-year-old educator, meanwhile, is rebuilding his stamina now that he finds himself down one kidney. Both Russell, and his brother, Jack, who died last year, were afflicted with Alport Syndrome, a genetic condition marked by hearing loss, vision problems and kidney disease. Because of that diagnosis, Title said the kidney function for both of his sons was monitored. It was then that he and his wife Laurie began having Russell’s kidney function tested on a monthly basis, and the search for a kidney donor began. Having the same blood type as his son, Title was designated as the “back up” donor, he said, but it started to become clear the transplant would be needed sooner, rather than later. He said he was hoping to perhaps find a younger donor match, but Title said Russell’s doctors assured him he would get at least another 20 years from dad’s kidney. Alport syndrome is a genetic condition characterized by kidney disease, hearing loss and eye abnormalities. Alport syndrome occurs in approximately 1 in 50,000 newborns. About 80 percent of cases are caused by mutations in the COL4A5 gene on the X chromosome. In males, who have only one X chromosome, one altered copy of the gene is enough to cause kidney failure. In about 15 percent of the cases, the condition can be inherited if both parents each have one copy of the mutated gene. Wanting to shield both patients from the risk of infection, Title was sent home on May 1 and Russell was released from the hospital May 2. Russell celebrated his 26th birthday on May 3. It has been up to Laurie Title to manage the medications both father and son need. And she doesn’t mind one bit. “It was all wonderful,” she said. “When you have something like this, when there’s a direction and a team in place and they know what to do,” it makes the surgery and recovery easier. Laurie Title said there was no nervousness about the outcome as there was when Jack’s kidneys suddenly failed. “With Jack, there was no plan, no direction,” she said. Four weeks into recovery, Title said he has been a little antsy about getting back to work. “He’s never taken a month off since I’ve known him,” Laurie Title said. Fenway Park is off limits right now to the die-hard Red Sox fans, but Title said he and Russell have been cleared to attend a Bridgeport Bluefish game.